New Year's Eve will be a celebration at Cranmore once again. We're hosting a special early New Year's party with fireworks going off at 7:30 and tons of other fun stuff leading up to it. Many activities are free and open to the public; others can be had for special package pricing, be it skiing, snow tubing or the new indoor Fun Zone. The list below indicates pricing, time and location of each activity. Cranmore is located in the heart of North Conway Village near area hotels, shops and restaurants. So make it an early family night for New Year's Eve at Cranmore! We'd like to thank the many people who turned out last night to help us celebrate the life of Jimmy Mersereau. 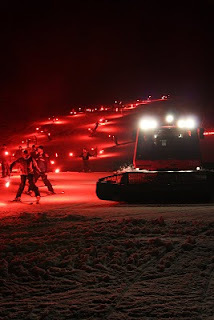 It was a moving and dramatic evening including a snowcat procession and torchlight parade. Special thanks to Thom Pollard who produced a special commemorative video and to Katy Cohn of Top Notch Photography for the wonderful photos posted here. Jimmy Mersereau was born May 5, 1943 at his family home in Bartlett, NH. Jimmy passed away peacefully at his home December 23, 2009. 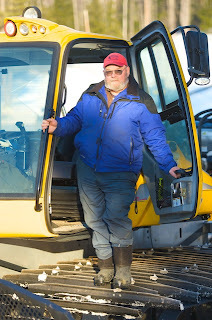 He had been employed at Cranmore Mountain since 1971 and was responsible for many aspects of resort operations. Jimmy loved life and was passionate about fishing and hunting, and recently took up the game of golf. He was at home in the outdoors and spent much of his personal and professional life outside. He loved his friends and family and was especially fond of his canine companion Sandy. He is survived by his adored long time partner Andrea Libby. His first job was at the Willey House in Crawford Notch caring for the animals. Then he worked for the State of NH doing plowing and road crew work through the Crawford Notch. He then worked construction for Whit Duprey. He found his niche at Cranmore and began a storied career there in 1971. 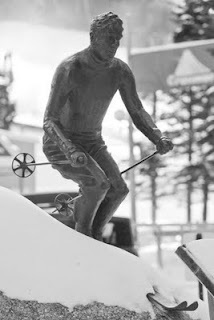 Jimmy was a legend in the ski industry having been a pioneer in now-common practices such as grooming and snowmaking. His expertise was recognized when he was chosen to be a groomer at the 2002 Salt Lake City Olympics. He was also a leader in environmental practices, applying for and receiving a grant for Cranmore to switch its grooming vehicles to biodiesel fuel in 2003. Their use of the fuel became a case study and a benchmark still used today in the use of this alternative fuel in cold weather applications. Cranmore was his home away from home and family referred to the mountain as “Uncle Jim’s Yard.” After a long hard winter on the mountain, Jim retreated each spring with his friends and loved ones to Grand Lake Stream, Maine to fish and recreate in the outdoors he loved so much. He then spent summer weekends at his camp in Pittsburg, NH fishing, reading and relaxing. He was a founding member of the Cranmore golf league team, the “Swingin’ Penguins,” who enjoyed consistent last place standings in Julie Rivers’ Traveling League. Jimmy was beloved for his youthful and exuberant outlook, having unbounding energy for every aspect of life in the Valley, be it his role as guest conductor at an Arts Jubilee concert in 2006 or wearing the Penguin mascot suit when called upon at special events. 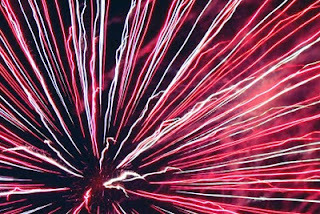 Fireworks held at the mountain had special place in his heart. Jim’s son Joshua and daughter in law Jennifer recently announced that they are expecting Jim’s first grandchild in May, 2010. Jim is survived by his longtime partner Andrea Libby of Conway; son James Allen Mersereau, Jr. of Uncasville, CT, John Cobb Mersereau of Conway; son Joshua Mersereau and daughter in law Jennifer of Palm Coast, FL; daughter Jessica Montgomery of upstate New York; brother Herman Mersereau; and sister in law Dottie Mersereau of Braintree, MA; brother George Mersereau and sister in law Nellie Mersereau of Mashpee, MA; brother Norris Mersereau and sister in law Betty of Plano, TX; sister Patsy Rogerson and brother in law Bucky Rogerson of Bartlett, NH and aunt Margaret Mersereau Margison of Fredricton, New Brunswick; and numerous nieces and nephews. Jim is predeceased by his father Reginald Mersereau; his mother Beatrice Keniston; sister Doris Rutledge; brother Gerald Mersereau; sister Betty Mersereau; and nephew Norman Mersereau; and mother of his children, Judi Eisner. In lieu of flowers, please send donations to the Jimmy Mersereau Scholarship Fund, c/o Cranmore Mountain, PO Box 1640, No. Conway, NH 03860. Calling hours will be from 10am-1pm at the Furber & White Funeral Home on Route 16 in North Conway, NH on Sunday, Dec. 27, 2009. A reception will be held at Cranmore’s Eating House starting at 5pm. 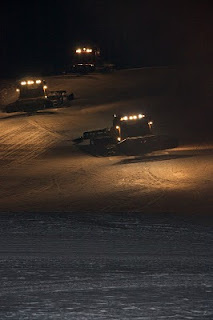 A Snowcat and Torchlight parade will be held at 6:30pm in Jim’s honor. There will be no church services. Burial will be a private family service at a later date. 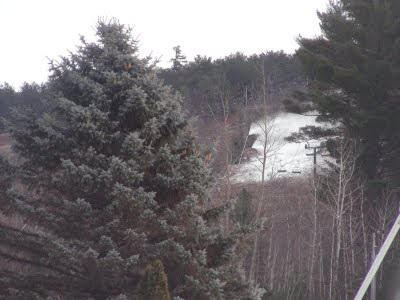 Friday, December 18 marks the start of Cranmore’s daily operations for the season. 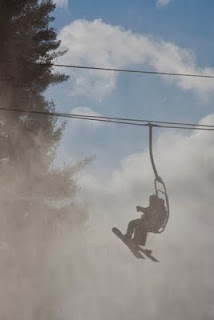 We had a great opening weekend and have been closed midweek with the snow guns roaring 'round the clock. For Friday, thanks to the hard work of our snowmaking team, we are forecasting 22 trails open, 87 acres open, 7.3 miles of skiing and riding. That's 46% of our terrain ... and it's only mid-December! Hard to believe two weeks ago we were looking out at brown slopes with rain coming down. That's New England weather for you. If you don't like it - wait a minute. Here are the trails we plan to have open for this weekend: Easy St. East Slope, Schneider, Gibson Pitch, Lower East Slope, Lower Schneider, Artist Falls, Gibson, Oompah, Lower Gibson, Beginner’s Luck, Snow Train, Lucky Pitch, Outta Luck, South Slope, Upper Hurricane, Middle, Comp Slope, Lower North Slope, Skimeister, Lower Skimeister, and Beginner Basin. This means that off the summit, you can ski on terrain for all abilities, in all 4 directions! Thanks to our 80 new tower guns, we've been able to make more snow faster and open more terrain earlier in the season. Speaking of terrain, we'll have several elements set up by the Lucky Loop lift on lower Beginners Luck. And to get you to all that lovely terrain, we'll be running 5 lifts. The Tubing Park will be open Saturday and Sunday from 9am to 4pm then opening daily starting Christmas Day, Dec. 25. We received a surprise snowfall last Sunday of 4-5" and another inch or two the other night. It's not a blizzard, but this on top of the 8 inches from last Wednesday and it's looking mighty white out there at Cranmore today! 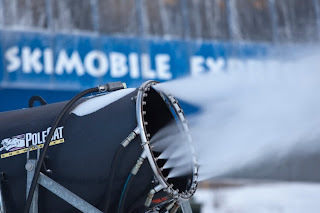 Weather forecast calls for ideal snowmaking temps continuing right through the week. Those warmer temps around Thanksgiving are just a memory now! Snowmaking will continue on Friday. We will be moving to Hurricane, Rattlesnake, Ledges, North Slope, Zip (Darkside Terrain Park) and the Upper Tubing Park. For Christmas we hope to have almost 70% of the mountain open which means we will be in great shape for the holiday week. So hurry up finish up your shopping so you can come skiing this weekend! Hit the outlets after a day on the slopes! 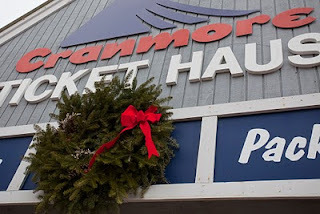 Cranmore opened today, Saturday, Dec. 12th. Conditions are spectacular! Here are some photos shot this morning. Popular trails like Artist Falls, Easy Street and South Slope are wow-ing skiers and riders today under brilliant blue skies. Come join us this weekend. 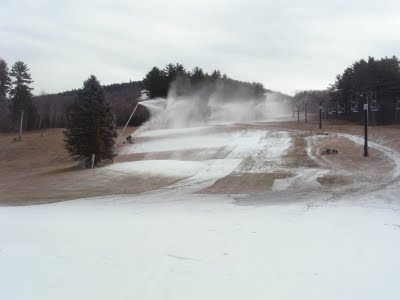 We'll be closed for snowmaking Mon. - Thurs. 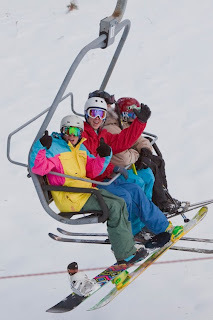 reopening Friday for our famous Ticket Roll Back Day - only $3.30 for all lift tickets on Dec. 18th. See you then! The good news is that colder temps returned overnight and Jimmy, Johnny and the crew were cranking out snow on South Slope, Beginner's Luck, Gibson, Easy Street, Beginner Basin, Lucky Pitch and Middle, plus the lower tubing park. Current operations call for more snowmaking overnight tonight, Tuesday, then resuming on Friday after Thursday's anticipated rain event. 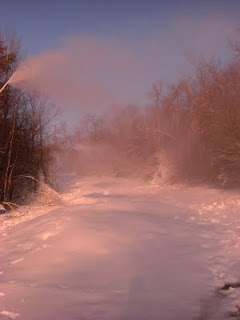 Here are some photos of some of our 80 new guns cranking out snow on the South and on Middle this morning. The bad news is that despite the headway we are making, that our opening day is now projected for Sat. Dec. 12. This will allow us to maximize snowmaking over the weekend when colder weather becomes more firmly entrenched. Plan on skiing, riding and snow tubing on the 12th. With any luck we'll have the Lucky Loop jib park set up as well. 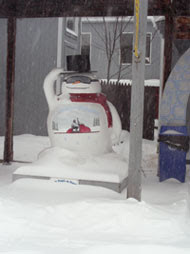 In the meantime, visit us at the Settler's Green mini-tubing park on Sat. Dec. 5th from 11am - 3pm in North Conway. Finish up your holiday shopping and let the kiddos ride a snow tube down a mini tubing hill right in the heart of the outlet village! C-more the Penguin will be there and Santa usually goes for a slide as well. Our friends from the Mount Washington Valley Children's Museum will be at the event selling penguins for the January 9th Great Penguin Race at Cranmore to benefit the Museum. They are a great organization and need our support now more than ever. These cute little penguins are only $5 and make great stocking stuffers even if you can't make it to the Jan. 10th event. As a thank you, we'll be giving out discount coupons for our Tubing Park and Fun Zone. Stop by to enter to win a Tubing Season Pass too! In the meantime, do your snow dance, say your prayers and we'll see you on the 12th!